The Wondering Whale Watchers are crazy characters on a quest to become like whales with hilarious consequences. They swirl the audience into a high-energy comedy adventure juggling to catch food, bubbling under-water music, receiving e-whales from a giant whale puppet called Wanda. The Whale Show is a family production that uses a large puppetry to enlighten and entertain the audience. The two protagonists have spent so much time with whales they behave just like them and even speak whale language, sharing their awe and wonder of these magical creatures. Themes include similarities and differences between whales and humans, threats to whales and whale facts and figures. The audience is encouraged to think critically about their values and the importance of whale conservation when the audience is invited to stop the giant harpoon. The Whale Show is 45 minutes in duration and is suitable for Grades R – 3. An accompanying drama skills workshop of 45 minutes is also available. After a 3 year hiatus The Whale Show, based on Heathcote Williams’ ‘Whale Nation’, returned to the stage in 2011 opening with a run at Kalk Bay Theatre. 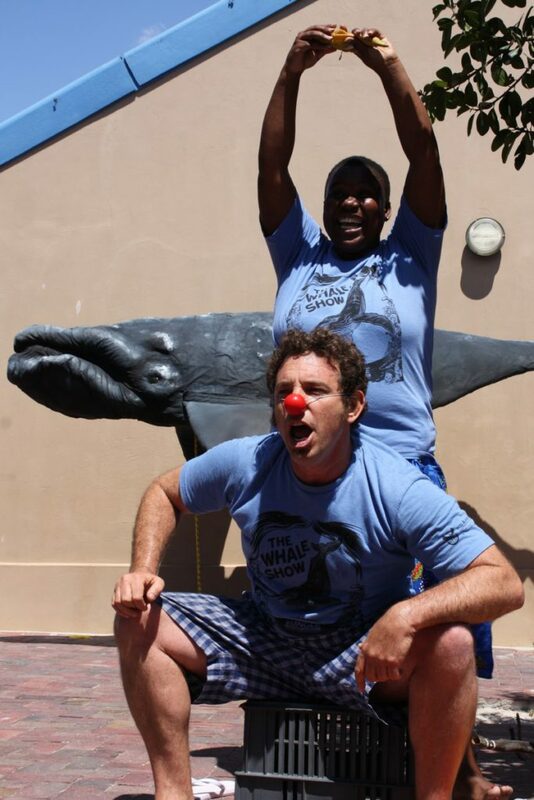 Created in 2001, the play has toured the National Arts Festival; Out The box festival, the Whale Festival in Hermanus; and numerous schools as part of International Fund for Animal Welfare’s (IFAW) outreach education and awareness campaigns including twinning programmes with underprivileged and privileged schools. It has also been included in the YES programme for Marine Week and enjoyed successful public runs in Knysna, Plettenberg Bay and Muizenberg in 2008. In October 2015 The Whale Show traveled to the Overstrand region where it was performed for learners from local schools. The show was last performed at the City of Cape Town, Biodiversity Management Staff at our year end function in November 2016. Vincent Meyburgh and Ntombifuthi Mhkasibe.